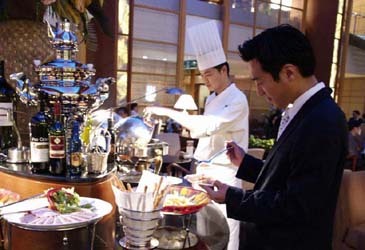 Beginning in November every Saturday from 6:00 to 9:00 p.m. the Lobby Lounge at the COEX InterContinental Seoul will be the site of a delicious buffet, unlimited beer and wine as well as great live music. All these wonderful things are now part of the Saturday Night Gourmet Buffet. The Lobby Lounge is famous for its wide open spaces, making your enjoyment of the music and our prime buffet even more delightful. This is the perfect opportunity to meet old friends or take a date while partaking of your choice of beer or wine. The buffet itself is an experience with seven different kinds of salads in addition to menu items like fried rice, sauteed vegetables, sweet and sour pork, seafood gratin, eel teriyaki, beef tempura and roasted chicken with herbs — all specially selected by our chef.